Toe-tapping tunes to make you smile, darn ya, smile. Contact Dean for booking inquiries or other information. Part blues and part old school country, seasoned with a pinch of gospel, Kentucky-born guitarist Dean Phelps combines the rhythmic beat of thumbpick guitar with a soulful vocal style. 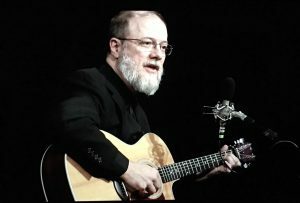 He stirs his guitar and voice into a repertoire of songs from the late 19th and early 20th centuries, creating a style that is reminiscent of performers like Merle Travis and Doc Watson, with just a hint of Leon Redbone. Dean has earned both local and national recognition for his guitar playing, winning the National Thumbpicking Guitar Contest at the Ozark Folk Center in Mountain View, Ark., and being named thumbpick guitar champion at the Indiana Picking and Fiddling Championship. Dean’s live performances have been well received in a variety of venues. He is equally at home playing in cafes, restaurants, concert venues, churches, private parties, and business gatherings. He is astute at recognizing what is required and tailoring his performance to fit the setting. Dean has appeared as the featured artist on Red Barn Radio, including the 2016 Appalachian Christmas special. Before returning to Kentucky this year, he performed at Denver area venues like the Oriental Theater and Swallow Hill. Dean’s latest solo release, Smiles – Live from Red Barn Radio, is a compilation of live recordings from his appearances on the Red Barn Radio program. Dean also teamed up with Brian Keith Wallen on a seven-song EP, Mountain Roads. Picking the Faith, released in 2012, marries the toe-tapping guitar beat of the thumbpicking style with traditional hymns and gospel music that he learned in his youth. His other CD titles include: Give Us a Song, which continues to receive radio airplay across the U.S. and Europe; This Old House, an exploration of Dean’s musical influences with producer Steve Creech; and his first recording, Going Over Home, released in 1997. If you like your music wrapped around you like a comfortable sweater….that’s exactly what you’ll find here. It’s a rare treat. He is Reverend Dean Phelps with no apologies, but even though he’s a Reverend, he’s not very churchy. He’s a regular guy with a fun repertoire, relaxed manner, nice picking, and a friendly way of putting a song across. The picking is of the highest quality, and as for Phelps’ vocals, no words of praise can depict how sublime they really are. It was a kind of grace note, undeserved. Dean is one of the nicest, friendliest guys I know, and [he] plays like cool water on a warm summer day. Phelps … has fallen in love with some of America’s first authentic music — the folk and gospel from the late 1800s and early 1900s. The haunting melodies and hopeful lyrics seem to bring a positivity that appeals … to audiences as well. If you want to kick back, relax, enjoy toe tapping tunes, soul searching lyrics, gleeful melodies and that overall feeling of ‘Oh gosh, I think I am HAPPY right now!’ . . . then be sure to spend time with Dean Phelps. High resolution images for print are available here.